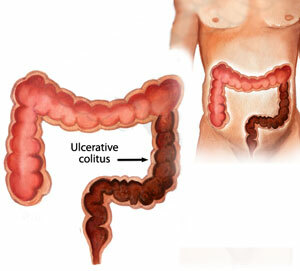 Ulcerative colitis (UC) is one of the forms of inflammatory bowel disease that is characterized by ulceration of the interior lining of the large intestine, which usually manifests itself as diarrhea mixed with blood. It is an intermittent disease, which means that periods of exacerbated symptoms are replaced by periods that are almost symptom-free. Ulcerative colitis usually requires treatment, though the symptoms can diminish on their own. There is no known cause for ulcerative colitis; however, there is a presumption that a genetic factor might play a key role. Ulcerative colitis is treated similarly to other autoimmune diseases. The treatment consists of immunosuppression, anti-inflammatory drugs, and biological therapy which target various components of the patient’s immune system. If the disease is very severe, colectomy might be performed, which involves the removal of a part of a whole large intestine. Though this might cure the disease, it is usually associated with complications.